The Ohaus Adventurer AX224N has a capacity of 220 grams and a readability of 0.1 milligrams (1 mg NTEP). These new "Legal for Trade" balances are great for retail establishments selling/buying gold, silver, precious gems, herbs and other commodities that require very fine measurement. 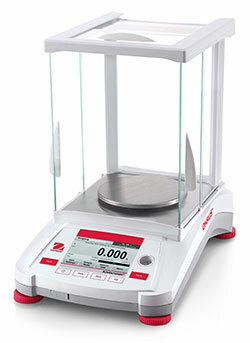 The AX224N has milligram readability and makes it also suitable for compounding pharmacies. This model also features Ohaus' InCal automatic internal calibration and the large color touchscreen of the Adventurer series.